Paint is just one of the many products that might be recommended for your project. Paint is generally recommended for any previously painted surfaces. There is a fair amount of confusion regarding the difference between paint and solid stain. We recommend paint when an opaque color is desired on a smooth, non-absorbent surface. Surfaces might include cement board siding, hard board siding, wood siding (smooth side out), vinyl siding, steel siding, windows and doors. There are many quality exterior paints on the market. We generally recommend a high quality 100% acrylic paint. Oil base paint is still manufactured and has some limited uses but is rarely recommended on a large scale. Most paints come in a variety of sheens. Flat and Satin are the most commonly used sheens. 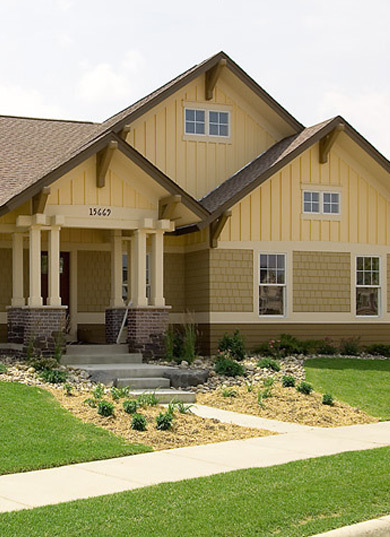 Flat is most often used on large areas such as siding because it is better at hiding minor imperfections. Satin is often used on trim items to provide some additional accent. Satin is a bit more weather resistant but most people still choose Flat to avoid having a shiny house. Our trained estimators can help you decide what the best products are for your home, and our skilled exterior painting contractors will provide professional results. Contact Tenet Painting today for a free exterior painting estimate. ©2009 - 2010 Tenet Painting & Decorating. Professional interior and exterior painting contractor. "The crew was great and they were easy to have around. I would ask for the same crew again in the future. Thank you for a great experience."